I have been inspired by a tutu-making friend who makes her own beautiful appliques. So I spent this afternoon playing with my wee embroidery machine and a lot of different stabilisers; tear-away (terrible fail), medium wash-away, wash-away topper and no stabiliser (too much bobbin thread visible). I bought the sturdy wash-away for some free-standing lace I want to try. It worked beautifully but I also tried some wash-away topper, the type used to keep the fluffy bits under control when you embroider fleece or towelling. The topper worked just as well and washed out more cleanly. This design was an asymmetrical snowflake scroll. It obviously lost some definition being stitched out on tulle but still looks rather pretty. 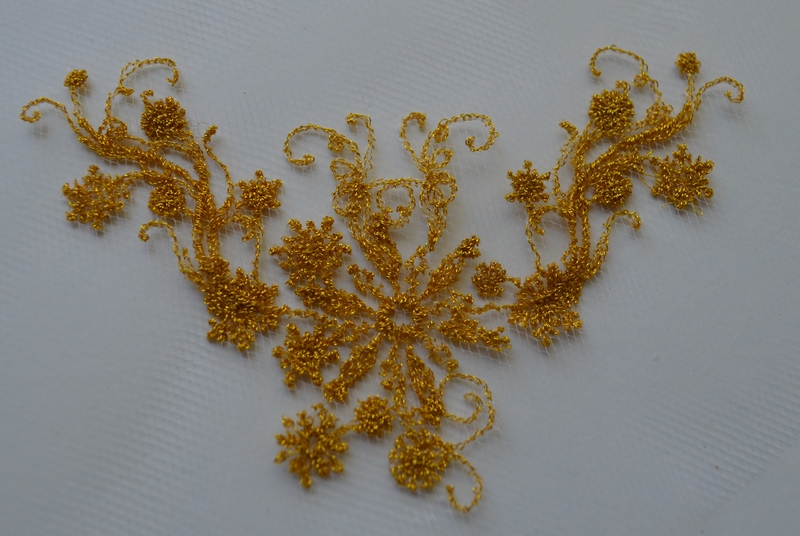 My idea is to stitch out some appliques and use them as a base for some tambour or beading.